How can teachers build mathematically powerful students, students who can solve problems and also communicate their understanding to others? Our longtime experience as elementary and middle school math teachers has proven that when students are engaged in a “balance” of mathematics activities, they can succeed where it counts—in applying their math skills and reasoning ability to solve real-life problems requiring mathematical solutions. Step 1: Math Review emphasizes the development of number sense while students practice procedural mathematics and computational skills. It also prepares students for success on the annual state mathematics assessment. Mental Math helps students become skillful in computing math problems mentally. Step 2: Problem Solving provides both a structure for problem-solving activities related to the current conceptual unit focus and a general problem solving rubric or scoring guide that is used throughout the year to assess student work. Step 3: Conceptual Understanding identifies in district and state math standards a particular grade-level or course topic that is essential for student understanding. That topic becomes the focus for the design of a conceptual math unit that deliberately aligns instruction to an end-of-unit assessment. Step 4: Mastery of Math Facts emphasizes fact recall through student understanding of patterns. A program of accountability enables students to learn all of their math facts by the end of elementary school. The process begins with the faculty “mapping” all of the addition, subtraction, multiplication, and division facts across K-5 grades. Step 5: Common Formative Assessment aligns math Priority Standards to school-based assessments for learning. These formative assessments are collaboratively designed, administered, scored, and analyzed within each grade level several times throughout the school year. Common formative assessments provide teachers with “predictive value” as to how students are likely to perform on district and state assessments in time for them to modify and adjust instruction to meet specific learning needs. “We are using this framework extensively in our school district. Five Easy Steps to a Balanced Math Program helps teachers focus on teaching concepts for understanding, as opposed to marching through a textbook. We emphasize that our state standards are our curriculum, and this is the framework we are using to plan and teach these standards for understanding to our students. Textbooks, like any other resource, are incidental to the implementation of quality math teaching and learning. “The processes outlined in Five Easy Steps became a critical component of our district’s Mathematics Strategic Plan beginning in 1998. 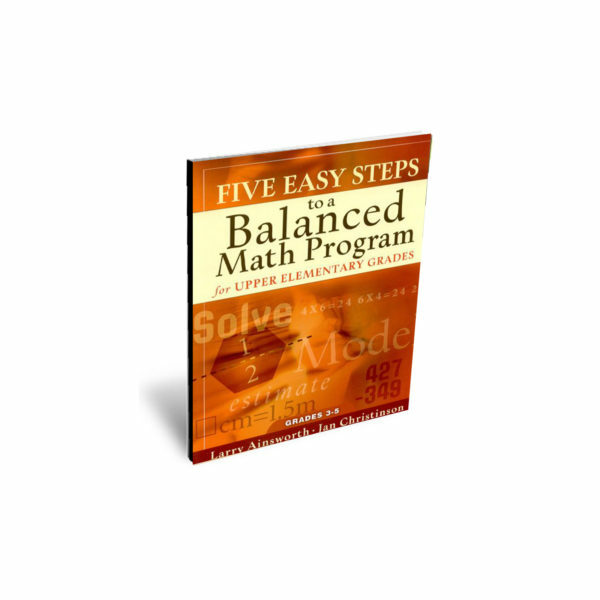 Five Easy Steps to a Balanced Math Program provided practical suggestions to assist our teachers with the implementation of the district’s mathematics program, [including] its required instructional components. While the Mathematics Strategic Plan serves as an umbrella for the district’s efforts, Five Easy Steps to a Balanced Math Program provided clarity of purpose and a systemic way of maintaining the focus.